LOS ANGELES — LeBron James got plenty of attention this week for his comments about Anthony Davis, prompting allegations of tampering and ramping up speculation about the two superstars playing together for the Los Angeles Lakers. “I’m a playmaker by nature, and nature kind of took over,” said James, who got his third triple-double in his first season with the Lakers and No. 76 for his career. Kyle Kuzma had 23 points, and Ivica Zubac set season highs with 16 points and 11 rebounds, helping Los Angeles to its sixth consecutive home win. Davis had 30 points and 20 rebounds for the Pelicans, who lost their third straight game. Julius Randle had 21 points in his first game back at Staples Center against the Lakers after playing four seasons with them, and Jrue Holiday had 18 points and 10 assists. 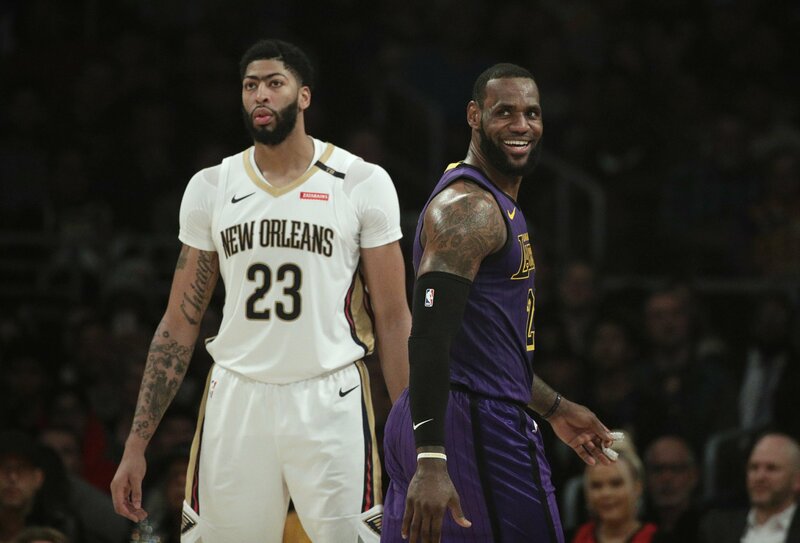 Davis and James shared the court for the first time since James recently declared in an interview with ESPN that it would be “amazing” if the Lakers traded for the Pelicans’ biggest star. But James showed why players around the NBA might want to take him up on an invitation to join the Lakers by helping all five starters score in double figures. James had seven assists in the first quarter, his most in any quarter since joining the Lakers, and his infectious ball movement helped his new team get 20 assists on 27 made baskets in the first half. As pleased as he was with the offense in the first half, Walton was even more impressed with a defensive effort that limited the Pelicans to 39 points in the second half. New Orleans shot 32.6 percent in the second half, leaving Gentry more concerned about his fifth loss in seven games than whether or not James tampered with Davis. James made it clear after the game he wasn’t happy about the furor over his comments and didn’t plan on taking a vow of silence any time soon. Davis took the opposite tact by brushing off James’ comments after posting the second game in the NBA this season with at least 30 points, 20 rebounds and five assists. Pelicans: Davis had a bandage placed on his left pinkie finger during the first quarter and appeared to be trying to shake out the injury as the game went on. … New Orleans committed 13 turnovers leading to 20 points for Los Angeles. The Pelicans got 11 points off 13 Lakers turnovers. … Nikola Mirotic missed his fourth straight game because of an ankle injury. Lakers: Zubac got the start with JaVale McGee missing his third straight game because of illness and scored eight of the Lakers’ first 16 points. . Brandon Ingram scored 18 points after missing seven games because of a sprained left ankle. . Rajon Rondo had eight points and nine assists off the bench after missing 17 games because of surgery on his right hand. Pelicans: At Sacramento on Sunday. Lakers: Host Memphis on Sunday.